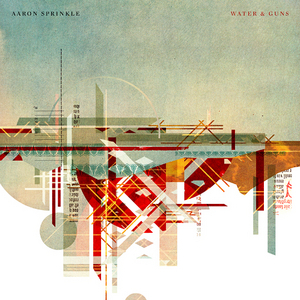 Aaron Sprinkle – Water and Guns | NoCoda. What It Sounds Like: Already an all-star from his works in Poor Old Lu, Fair, Rose Blossom Punch, and a crazy amount of Tooth & Nail productions, Aaron Sprinkle now brings us his fourth official solo record (his first in twelve years of all brand new tracks), which takes on a more synth/electronic approach than we could have expected. Still, Owl City this isn’t, and leave it to Aaron to knock it out of the park; you have a winner on your hands. I’d being lying to you if I said I wasn’t already partial to this record before it even touched my player. Kick me off the jury – I have a strong bias. Water and Guns, however, is a bit of a curveball. It’s much more slick of a record than I was expecting from a solo release, as it takes some of the keyboard elements from Fair and amplifies them to become much more dominant from an electronic standpoint. But, as I said in the beginning, this isn’t Owl City. This isn’t The Postal Service. This is, not by any stretch of the imagination, synth pop. However, it does make some stronger nods in that direction than any of his past work does, so the comparisons are well warranted. Straight guitars and live drums are overshadowed by slick production elements, and while that may not be my go-to, here’s what I, as well as you, reader, need to keep in mind: this is a natural progression for Sprinkle. He veers into slightly new territory, but makes it his own, and excels. Nothing overly borrowed here. It’s also essential to recognize that while electronics, keys, and piano may play a much larger part here than they ever have before, the go-to acoustic guitar is found on almost all of these tracks – it’s simply just not the main attraction, but it’s used enough to let us know that it’s there – you don’t have to search for it. This record goes down smooth, from the aquatic means of keys that make opener Heatstroke into the pop jam that is meant to be, to the beckoning of the night sky, open road, and 3-in-the-morning commutes in the floating Can’t Last Forever. Elsewhere, River Of Lead shoots to be grand as grand can be, while the minimalist bass synth jam Turn Around sounds just as large without even trying. The piano, by far, is the weapon of choice for Sprinkle on Water and Guns, showcased the best on the killer Whisper Something. A simple treble melody is soothing in the verse, while the chorus takes on a fantastic a set of bass key strokes, along with a classic “stomp, stomp, clap” backer. But it’s always a storm. Getting harder to swallow this disguise. I’ll live to love another day. As stated, this is a change in sound for what we were expecting to hear from Aaron Sprinkle, but there’s nothing here to find fault in. It’s like using a crayon to make a picture instead of a finely-sharpened colored pencil. It’s different, but it can be just as rewarding.